This all-in-one kit produces 12 cupcakes that look just like your favorite forest-dweller of lore. Craft a dozen of your very own one-horned cupcakes with the aid of this magical all-in-one kit. 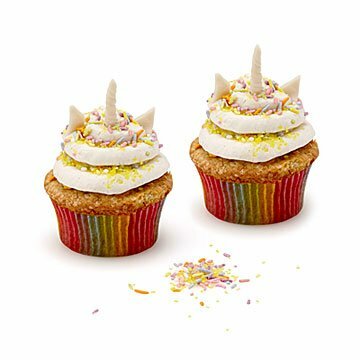 Jillian Donaldson's vegan-friendly vanilla bean cupcake and buttercream mixes get the party started, with rainbow tin liners, playful sprinkles, and organic vegan fondant—ideal for shaping twelve petite horns—for each cake's finishing touches. All you need to bring? Butter, eggs, and milk, or oil and non-dairy milk, plus a healthy dose of positivity… or at least enough to conjure your inner mythical creature. Rain, shine, or unicorn fête, this kit's a surefire DIY crowd-pleaser. Handmade in Virginia. We spoke with Jillian about the little things that maker her kitchen magic, like her grandmother's heirloom stand mixer. Read our Q&A with her on our blog. After over a dozen years working in the food industry in Miami, Nashville, and Washington, DC, pastry chef Jillian Donaldson decided to bring her passion for baking with fun, all-natural ingredients into the homes of others. She originally started mailing baking kits to family and friends who lived too far away to enjoy her small-batch pastries, essentially “teaching a man to fish” (so he can feed himself cupcakes for a lifetime, of course). The idea that anyone can bake beautiful, high-quality pastries at home became a passion, as did educating both newbie bakers and pastry experts alike on the importance of ingredient knowledge and decorating techniques. Jillian believes that even when we indulge in pastries, an awareness of quality and origin of ingredients is key—and achieves the most scrumptious end result. I don't care how old you are - turning things into unicorns can't make a single person sad. And, cupcakes don't make people sad either, so why not combine the two and make someone's day? Perfect gift for cupcake lovers of all ages! I ordered this kit as a gift for a sick friend who needed cheering up, who happens to be a cupcake lover. She enjoyed eating the cupcakes as much as she enjoyed making them! She said they were moist and delicious, and super easy to make. My nieces enjoyed making these and eating them!